GPS – It’s Not Just For Geocachers! OK folks, let’s put on our big boy pants and play grownup GPS. I’m involved in a test at a very large and very busy airport to determine the feasibility of using inexpensive handheld GPS receivers as reconnaissance tools for our engineering and facilities staff. The consumer market is crammed with relatively inexpensive GPS devices and any one of those should fit the need. We are not necessarily looking for accuracy here; most dedicated GPS units made these days offer plenty enough accuracy. More important for our project is ease of use, the ability to import a fairly high resolution background image of the airport and the ability to provide coordinate read-outs in our proprietary (i.e., non-standard) grid system. Let’s start with the proprietary grid system issue. It may sound daunting, but it’s really not. A fair number of low end GPS units provide what’s called a ‘user coordinate system’ setting. The user just needs to provide a center point for the grid (in lat/long), a false northing and easting for the center point, a scale factor and few other bits of information. It’s pretty straight forward, and we’ve been able to program a 13 year old Magellan 315 to handle the task. The Magellan 315 was a hot-spit GPS unit in its day but by today’s standards it is out dated. It is relatively slow to boot up, slow to acquire and lock onto satellites and it doesn’t receive WAAS signals. Still, it is easy to operate, the screen is a classic example of uncluttered high contrast clarity and it takes user coordinate system definitions without breaking a sweat. Once it was up and operating it provided perfectly acceptable accuracies. Next we tested a seven year old Thales Mobile Mapper. The Mobile Mapper was a piece of kit left behind at the close of a project several years back. The contractor bought it to help locate underground utility marker balls and turned it over to the airport when the contract ended. It’s an odd duck piece of gear – not friendly enough to take on a fishing trip but not sophisticated enough to satisfy surveyors. Still, it was perfectly willing to accept our coordinate system definition and returned fine accuracies. So we proved it’s possible to program our coordinate system into inexpensive GPS units. It should be a simple task to identify a more modern unit that fit our performance and budget requirements. This is where things got interesting and frustrating. Our quest has revealed an ignored market segment for GPS units and leaves us scratching our heads and wondering just where the consumer GPS market is heading. GPS is marvelous technology. It has removed the great uncertainty in wayfinding and positioning that has vexed mankind since the first caveman decided to go from here to there and his wife told him where to turn. The real genius of GPS has been in the integration of the location signal (and that’s all GPS really is – a bunch of signals from satellites in the sky that provide the information a GPS receiver needs to calculate a position) into devices that leverage that location in unique ways. Twenty years ago a ‘consumer grade’ GPS was an expensive piece of gear that did little more than provide a location and allowed you to store a few dozen waypoints. In 1999 I purchased the Magellan 315 used in this test for $300, and was happy to get it at that price. Today $300 buys a unit that provides a position fix that is twice a precise as the 315, uses a high resolution color touchscreen display, stores thousands of waypoints, has a digital 3-axis compass, a barometric altimeter and a digital camera that takes geotagged images. Most consumers are not educated enough to understand that a dedicated GPS unit offers features that make it uniquely suited to outdoor use in rugged environments. GPS integration in a smartphone is a compromise, particularly the antenna system. On a smartphone GPS has to coexist with a range of other receivers and transmitters that all require their own antennas – cell, wi-fi, Bluetooth, etc. A smartphone is first a phone, and other features like GPS get secondary design consideration. But with a dedicated GPS unit optimized GPS reception and performance is the primary design goal. First and foremost we expect a GPS unit to provide fast and accurate position fixes under a wide range of conditions. If you want to know where to find the nearest Starbucks get a smartphone. If you are on a seven day backpacking trip and its been raining the last three days and you want to know where the next campsite with a bear box is located get a dedicated GPS. So let’s take a closer look at how the market is broken down. Today’s dedicated GPS devices fall into three broad categories. 1. Consumer grade devices like we are discussing here. This market is focused mainly on those participating in outdoor sports like geocaching, hiking, biking, fishing, etc. These devices cost between $200 and $700, with the bulk of sales taking place at around the $300 price point. This is the market segment that receives brutal competition from other consumer devices like smart phones, and the manufacturers are scrambling to find a niche and stay relevant. Garmin, Magellan and DeLorme are the three leaders here. 2. Dedicated map data or field data collection devices. 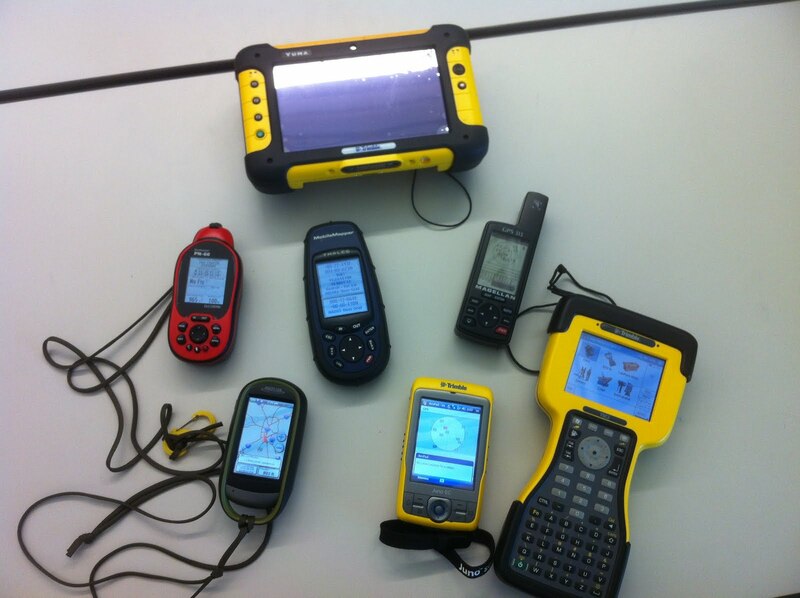 These are handheld units running mapping software like ESRI’s ArcPad and are used by organizations like utility companies to collect information in the field. These mapping devices have an entry price point of around $1,000 and can go up to over $3,000. Most of these units offer more GPS accuracy through the use of improved antennas and better software, but offer fewer features like digital compasses and altimeters. The big attraction with these GPS units is the flexibility of the mapping software and the ability to directly ingest the collected data into high end desktop mapping software like ESRI’s ArcGIS suite. The additional cost for these dedicated GPS units is the result of a smaller market share, higher hardware costs and the increased cost of the the operating system (usually Windows Mobile) and the mapping software. Trimble Navigation dominates in this market. at least it runs Windows! 3. The high end market is dominated by survey-grade GPS units that start around $5,000 and can peak out at over $30,000. For that price (along with a subscription to a real-time correction service that runs a few thousand each year) the user gets accuracies on the order of a few centimeters horizontally and vertically while working on-the-fly. Not for the casual user, but it is interesting to note just how much accuracy thirty grand can buy. of +/- 4 cm within 5 seconds of being placed over a point. How big is 4 cm? About the size of a poker chip. OK, back to our original topic. We selected a fair number of units to test – the Magellan 315 and Thales MobileMapper mentioned earlier, a Trimble Juno and Yuma, a Magellan eXplorist 610, a DeLorme PN-60 and a Garmin eTrex 20. The DeLorme and the eTrex quickly fell out of the competition. The DeLorme does not support user coordinate systems (a very disappointing shortcoming in an otherwise outstanding GPS unit). The eTrex does have a user coordinate system setting, but it only works in meters (our custom airport coordinate system is set up in feet). I was really pulling for the eTrex 20 because it’s the cheapest of our test samples ($175 Amazon price), has a good screen, an intuitive menu system and its receiver tracks both the US GPS and the Russian GLONASS satellites. Alas, Garmin tech support could never figure out how to get it to provide readouts in feet so back to the store it went. The Trimble Yuma is really a tablet computer running Windows 7. It is a very capable device, but at the $5,000 price point falls way outside of our test objectives. The Trimble Juno is an interesting unit. It is essentially a highly customized PDA that runs Windows Mobile 6.1. This Juno is really the lowest entry point in terms of price and features for a serious handheld GPS mapping and field data collection device. Unfortunately the entry price is still too steep for this test – the hardware itself costs around $1,000 and the software needed to do field reconnaissance and data collection – ESRI’s ArcPad – runs an additional $400. A good device, just too expensive and too complex for the non-technical user. The Trimble TSC-2 seen in the picture above is not really a GPS receiver. 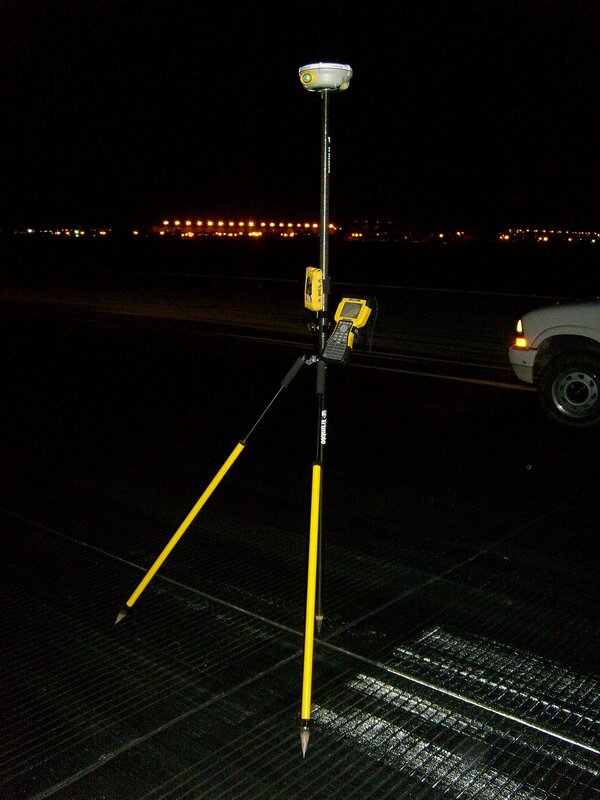 It is a survey-grade data collector that pairs with a high precision GPS receiver via Bluetooth (we use a Trimble R8) . I threw it into the picture just for comparison. The Magellan 610 pulled ahead early in the competition. It’s a mid-sized unit that’s a bit chunky but fits well in the hand. It uses a touch screen interface and it includes a 3.2 mp camera that geotags each image. After some fiddling it took our custom coordinate system and returns very good accuracies on the order of +/- 10 ft. I should mention that a large airport is an ideal location to test potential GPS accuracy since you have open skies horizon-to-horizon. If the GPS satellite is above the horizon your receiver will see it. No trees, buildings, towers, etc. in the way. So please, don’t take my accuracy results as gospel. Your real world results will vary. Where the Magellan 610 stumbles is ease of use. It has a lot of features – GPS, camera, compass, barometer and altimeter. It is a jack of all trades and, to be honest, most features are fairly well integrated. However, learning to use them takes time and it’s easy to get lost in the touchscreen menu system. The Magellan also suffers from a disease that afflicts most other consumer grade handheld GPS units – ‘gamesmanship’. 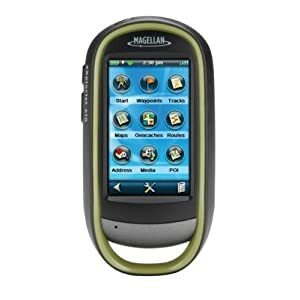 In an effort to attract new customers manufacturers like Magellan, Garmin and DeLorme have built their user interfaces around the game or sport of geocaching. It’s a fun game and a great way to get tech savvy kids off their asses and into the outdoors. The low end GPS manufacturers see this as a market niche they can exploit and have structured most of their unit’s features around geocaching. The problem we face is that geocaching-oriented GPS units makes lousy general purpose or field data collection units. By focusing on geocaching the manufacturers have ignored the needs of a whole different market segment – the map data developer. A weak coordinate system library, the lack of a GIS-industry standard vector data format such as the ESRI shapefile, weak data attribution tools on the GPS unit and a weak desktop mapping interface all hinder the use of these units as data collectors. DeLorme comes the closest with it’s XMap desktop GIS software, but the cost is over $800 per license it continues to use a proprietary vector data format linked back to the PN-series receivers. What the industry needs is a low-end map data collector that has a simplified interface optimized for adding and attributing data collected in the field. It needs to use industry standard vector and raster data formats and should come with a more robust desktop mapping interface oriented towards the field mapping industry or enthusiast. Magellan seems to be dipping its big toe back into this market with the Magellan eXplorist Pro 10, but this device still requires a third party software package like ArcPad and offers no improved desktop mapping software. This is just a re-packaged Magellan 610, but a good start! 3. a user interface highly optimized for field data collection – no third party software requirements! And I want this all at a $700 retail price point. So get to work. I expect some nice surprises in your 2013 lineups! This entry was posted in Technology, Tools and tagged gps by Brian Haren. Bookmark the permalink.